When Brilliant Earth was founded in 2005, we believed that it was possible to combine exceptional design and craftsmanship with the purest sourcing. Today Brilliant Earth’s design team leads the industry in crafting unique, exclusive designs that combine artistic inspiration with extensive jewelry expertise. In honor of our tenth anniversary our designers looked back at the ten engagement ring styles that made the biggest impression on them and on Brilliant Earth couples. One of our most beloved nature-inspired designs, the Willow Diamond Ring was hand-drawn in our San Francisco Design Studio after an inspiring walk in the park. The trellis design features wispy vines of precious metal and marquise diamond buds that bring the center gemstone to life. 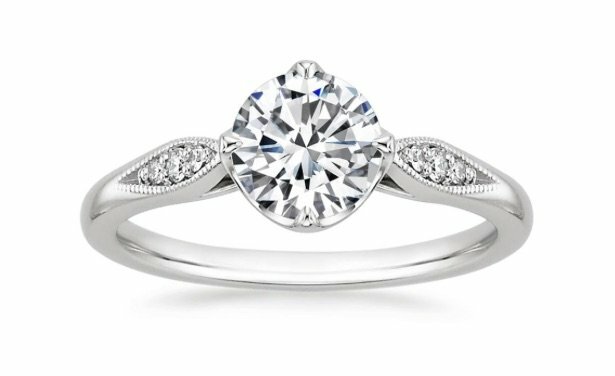 Classic halo rings have been a big trend for years, and now we see couples seeking out truly distinctive takes on that classic halo design. The vintage inspired Alvadora Diamond Ring has quickly become a customer favorite. Lavishly detailed latticework and a halo of diamonds encircle a bezel set center gemstone, and diamond accents and milgrain detail embellish the shoulders and the gallery. Part of Brilliant Earth’s Monaco Collection, the remarkable Riviera Diamond Ring features distinctive designer details. 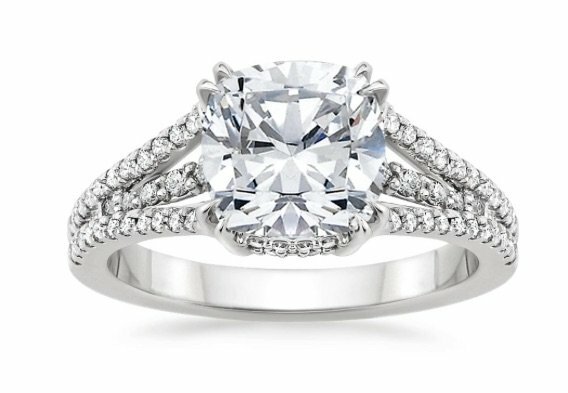 Three delicate strands of scalloped pavé diamonds rise to showcase a center gemstone in a sleek dual claw prong setting. Surprise accent diamonds adorn the gallery, creating sparkle from every angle. An enchanting interpretation of nature’s beauty, the extraordinary Lily Ring features a perfectly symmetrical three-dimensional flower design. Twelve petals of pavé diamonds dazzle around the center gemstone and diamonds extend down the sides of the ring for an unforgettable look. In the alluring, beautifully detailed Jolie Ring, elegant claw prongs embrace the center gemstone in a chic compass point setting. Pavé set diamond accents sparkle from within milgrain-embellished frames on the shoulders, and the gallery features an artistic scrollwork design. The Jolie is a sought after design from our Pretty Little Things Collection, which focused on classic designs updated with delightful surprise touches. Our design team loves the opportunity to partner with couples to create one-of-a-kind custom engagement rings. These five remarkable custom designs stand out as among the most memorable from our first decade. 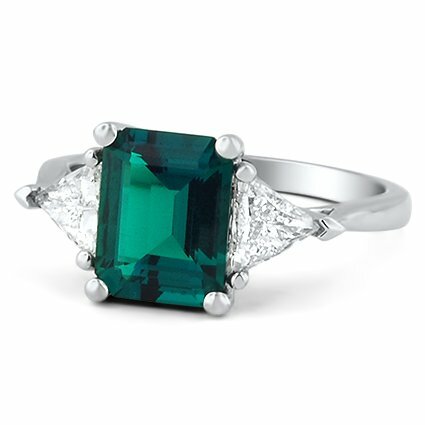 A custom design created for a bride who adores emeralds, the Emerald and Trillion Cut Diamond Ring showcases a stunning deep green emerald, accented by trillion cut diamonds on either side of the center gem. A gently tapered band adds a designer touch. 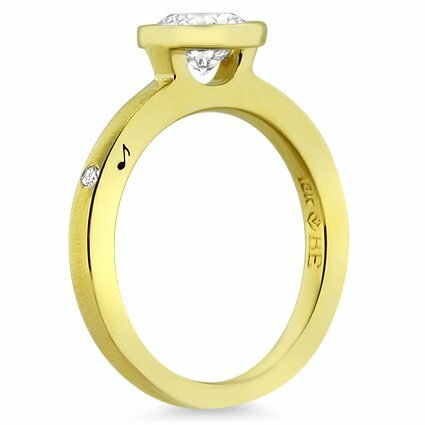 Created for a couple who is passionate about music, the whimsical Music Note Detail Ring features a round diamond set in a matte yellow gold bezel. The high polish yellow gold band holds surprises on the side: A flush diamond accent and a small engraving of a music note. In the distinctive custom Two Tone Sapphire Double Halo design a double halo of diamonds are set in dramatic dark rhodium, creating an alluring contrast with the ring’s rose gold band. 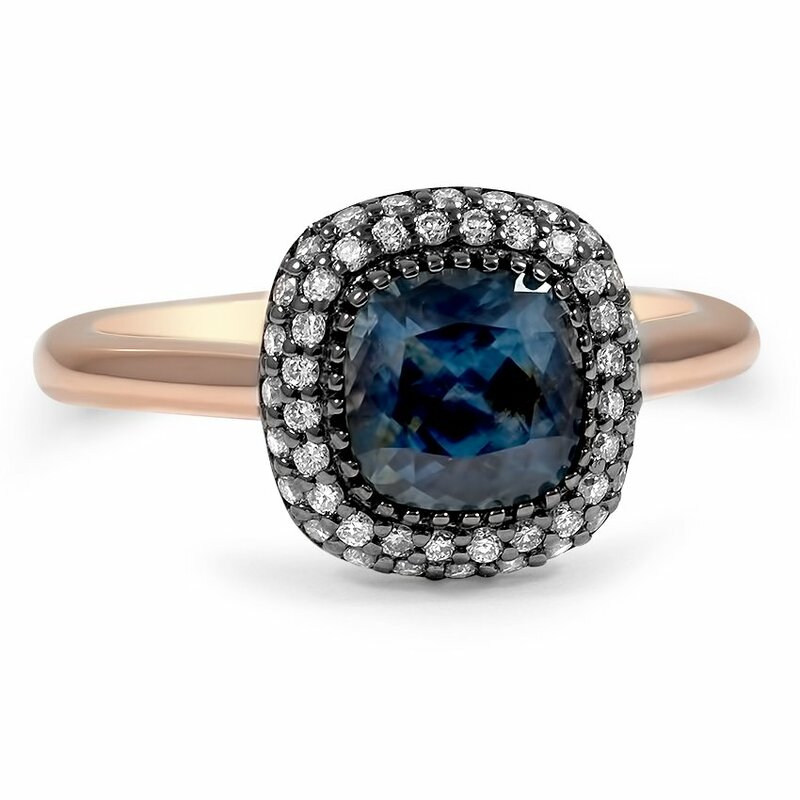 An exquisite teal sapphire at the center is encircled by petite rhodium prongs for a unique twist on a timeless look. 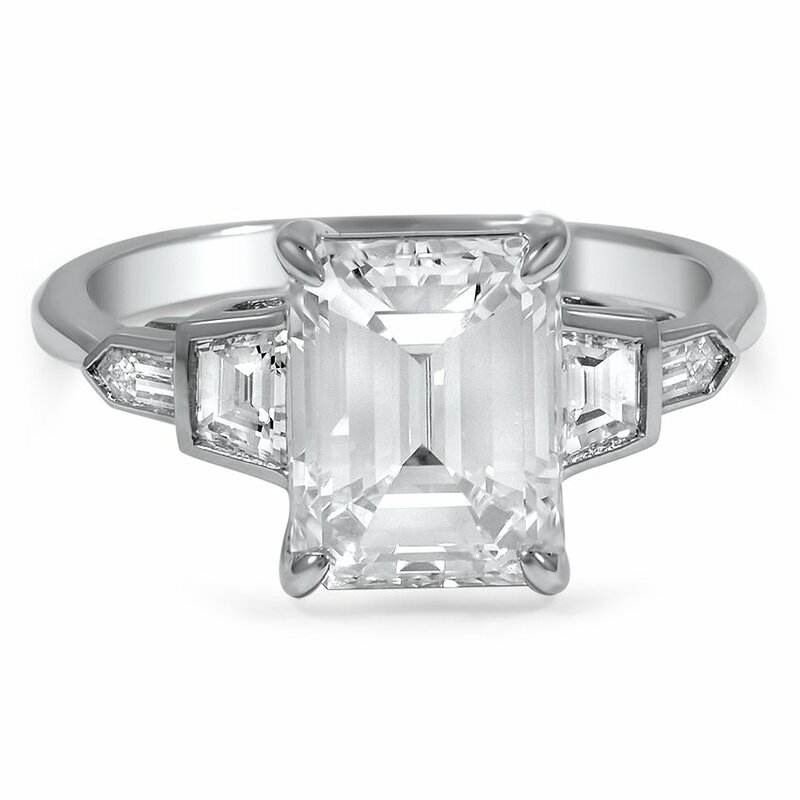 At once classic and very modern, this Modern Geometric Engagement Ring showcases an emerald cut center diamond with two trapezoid-shaped diamonds alongside it and two custom cut bullet-shaped diamond accents. Sleek claw prongs secure the center gem. 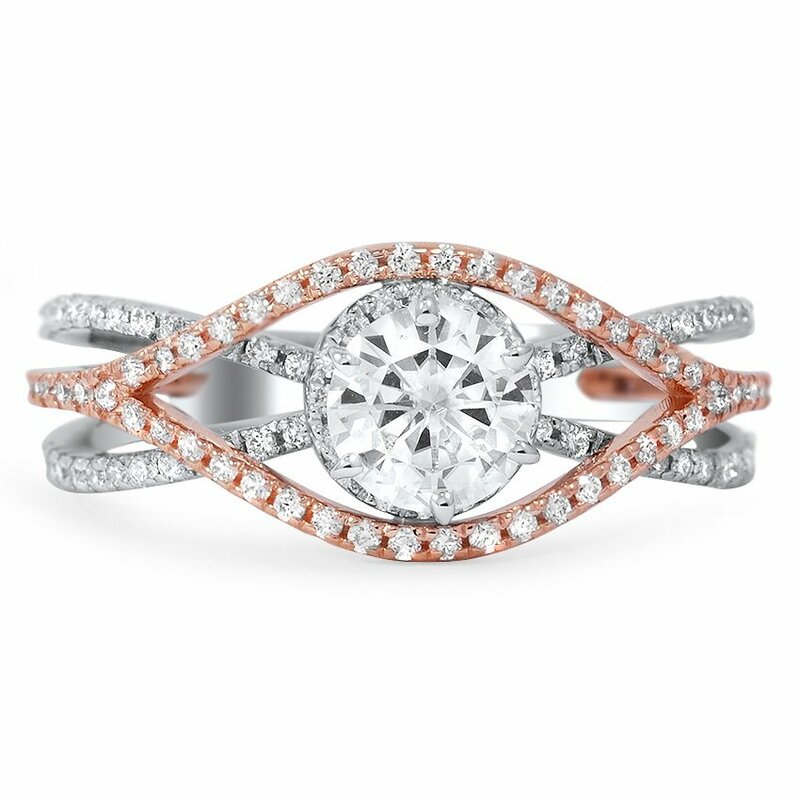 This Woven Mixed-Metal Diamond Ring, a truly unique custom design, creates an enchanting interplay between white and rose gold. 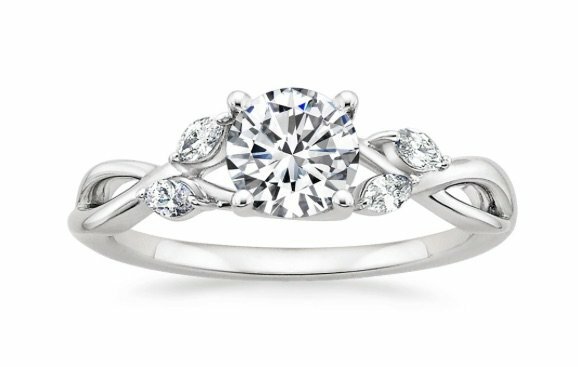 The six prong setting is delightfully accented by ninety shimmering diamond accents on an elegantly curving, woven band. What do you think of our “Top 10” rings of our first ten years? Let us know on Facebook or Twitter, or in the comments! I came across your website as I was searching for wedding ideas. My wonderful fiancé proposed to me in Hawaii with a beautiful Verragio engagement ring. It’s truly unique and breathtakingly beautiful. I’d love to share photos and have it featured on your site. Please feel free to contact me for further information. I’m a widow now but I have my wedding ring what would you suggest I do to make it into something I could wear now. Every girl has her own taste in style, color and shape of her engagement ring. These show a wonderful variety for most everyone. Take the willow diamond ring, make it yellow gold with oval diamonds and I’d be one thrilled girl….the geometric is also a stunner! The Geometric is my fav; the center stone is well-accented by the clean lines and opposing shapes on the sides. Most of the other styles are too fussy for my preference. This Geometric is stunning. My favorite is the Alvadora diamond ring. I don’t like any of the rings. All the settings detract from the center diamond and are gaudy. I didn’t see a single one that I would consider to be in good taste. In addition all have diminutive center stones. I would not wear one of these rings even if it was given to me. Colored engagement rings are quite the rage right now and a quality sapphire or ruby (corundum really) can be quite a bit more expensive than a comparable size “clear diamond” ring. Take my word for it, an elegant halo ring in platinum set with a quality sapphire or ruby leaves and worn on the left hand leaves no doubt that the wearer is engaged (and quite lucky at that). All the rings are lovely, but my favorite is the Riviera Diamond Ring. I’m sorry but I have to disagree with some of the ideas here. First, most girls don’t want a emerald or sapphire diamond engagement ring they want a clear diamond, they want people to know they are engaged and a clear diamond states that. 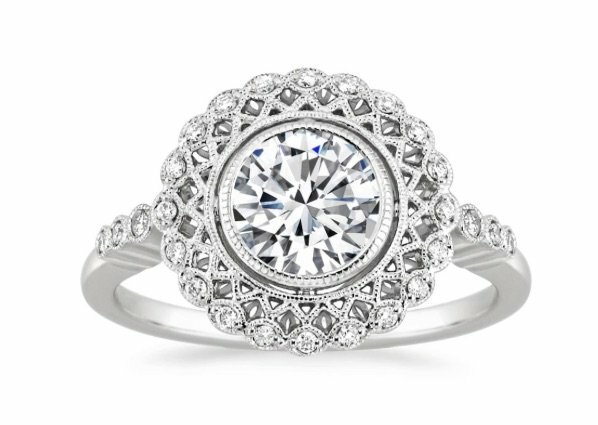 Second, although some think the older style sets and engagement rings that look like they are from the 1930’s-70’s are elegant, sophisticated and one of a kind lookers, lets just say we will call that a blessing. A lot of women still want that traditional round stone and the pear stone my favorite. I like that the settings of rings are changing and are becoming real stunners because lets face it the setting is half the ring and diamond is the other half. You have to remember its not what you like or what you think people would like, because everybody is different. But most every girl is the same in one respect when it comes to that engagement ring, they want it big, stunningly beautiful so it draws attention to others where they get that compliment, I can’t take my eyes off your gorgeous ring. That ring is going to make a statement about you, your fiancé every day of your life together of course it has it be magnificent. I know great grandma’s ring means a lot usually to just the guy because its his grandmother, but way back when how big do you think it was or if it even sparkled and its already had a lifetime of wear, most girls are just being nice when you pop it out to propose and they were not thinking great grandmothers old dreary ring, or even a replica of it. Well I could go on and on but I won’t you only ask for a comment not a book right. What about the Pear and the Marquis shaped diamonds? They are lovely! I have one, engaged 47 years ago. Are they not popular anymore? 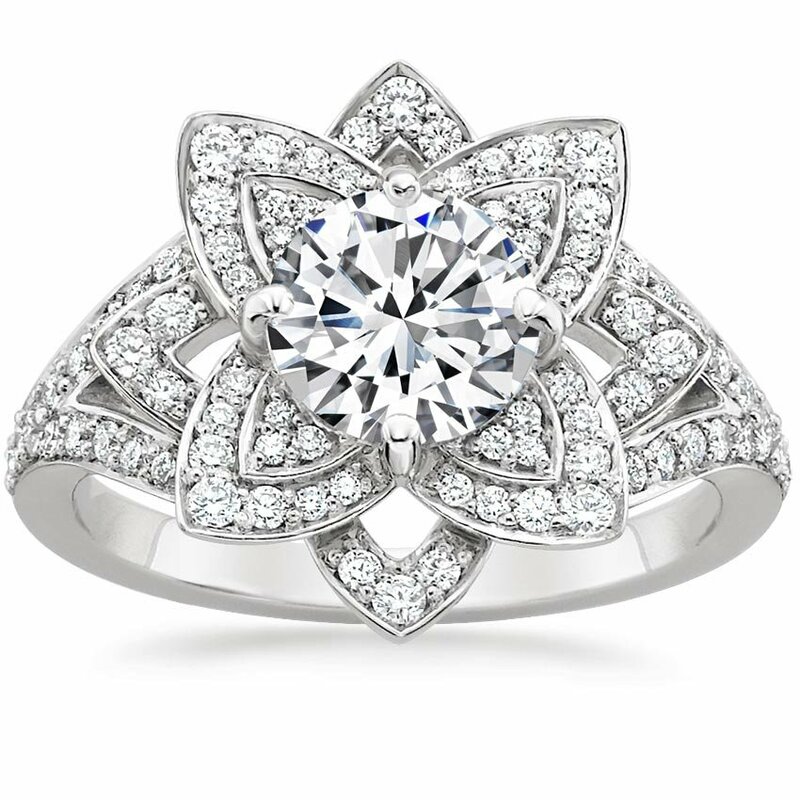 Hi Ammy, the Lily Diamond Ring starts at $2,650 and you can view it on our website here: http://www.brilliantearth.com/Lily-Diamond-Ring-(1/2-ct.-tw.)-White-Gold-BE1M3D08-1279007/. Thanks for your interest! Really Brilliant Earth has very unique designs love all the designs specially Lily Diamond Ring . can you tell me price and all the details regarding this ring.. I love not only the idea of Brilliant Earth, but the designs are magnificent. I enjoy opening my email each week and looking at what Brilliant Earth has to offer. My favorites are the estate pieces. Thank you.